The emergence of Governor Mohammed Jibrilla of Adamawa state as the APC flag bearer for the 2019 governorship election is no longer news. The party’s primary has come and gone as winners and losers have also emerged while the National Working Committee, NWC, the highest decision making body of the party has just ratified the candidature of Governor Mohamed Jibrilla. The flag bearer’s emergence was glaring right from the party congresses that elected delegates for the primaries as the governor used the instrumentality of his office to cage the delegates to his advantage. Senator Abdulla’aziz Nyako, who was an aspirant from the other faction of the APC in the State did not match the political machinery of Governor Jibrilla during the ward, local government and State congresses of the APC in the State. Senator Nyako’s faction of the party raised series of alarm, petitions and a threat to boycott future activities of the party but their cries fell on the deaf ears of the appropriate national organs of the party. There was a bitter struggle over the conduct of the APC congresses the Senator Abdulla’aziz- led group and another group of the defunct Congress for Progressive Change, headed by Alhaji Ibrahim Waziri. The group tagged itself Buhari Campaign Organization, BCO. The two factions of the party fought tooth and nail to abort the conducted congress, but to no avail. In the heat of the struggle, the group led by Abdulla’aziz Nyako decided to withdraw and all their supporters moved to the African Democratic congress ADC, leaving the Ibrahim Waziri-led faction that has former Secretary to the Government of the Federation, SGF Mr Babachir Lawal to square up with the Governor Mohammed Jibrilla led APC. However, Jibrilla’s faction of the party had the support of the national and zonal chapters of the party. The faction enjoyed the patronage of the incumbent Secretary to the Government of the Federation, SGF, Mr Boss Mustapha and the national vice chairman for the north east, Mr Salihu Mustapha as the march towards the party primary drew closer.As the primary election drew closer, the Ibrahim Waziri faction of the party went to a Yola High Court to challenge the conduct of the party congresses but lost the case to the Governor’s faction. Governor Mohammed Jibrilla had the delegates in his kitty and was almost heading towards becoming the sole aspirant of the party in the September governorship primaries. Then suddenly, posters of Dr Mohammed Halilu, the younger brother of Aisha Buhari, wife of President Mohammadu Buhari started appearing at some strategic locations in the state capital. Precisely two weeks to the primary, Dr, Halilu was reported to have picked intent form at the APC headquarters in Abuja to contest with Governor Mohammed Jibrilla in the primary. Before the news of Dr. Halilu’s intention to run died down, another aspirant, former EFCC boss, Nuhu Ribadu emerged. Dr. Halilu, Buhari’s brother-in-law and former EFCC chairman’s entry into the guber race really heightened political tension in the state. The duo presented themselves to the state working committee (SWC) of the APC to signify their intention to contest against the sitting Governor Mohammed Jibrilla, who as at that time had the delegates and the backing of the state executives of the party. When Nuhu Ribadu and Aisha Buhari’s younger brother visited the state APC secretariat a day after each other to declare their intention to run in the primary, the state capital was at a standstill because of the unprecedented crowd of their supporters. Few days after Dr Halilu and Nuhu Ribadu presented their intent forms to the state executives of the party, it was the turn of the Governor, Mohammed Jibrilla to test his popularity with the people. It was a carnival like ceremony as the turn-out of people to witness the declaration of Governor Jibrilla was equally as large as that of Dr. Halilu and Nuhu Ribadu. When Governor Mohammed Jibrilla presented his intent form to the state party executive, the chairman of APC in the state, Alhaji Ibrahim Bilal either knowingly or unknowingly made a declaration that the party had no other aspirant than the governor. The national secretariat of the party in its desire to conduct a free, fair and transparent primary, punished the executive of the state party. All the 37 members of the state executive of APC were banned from the governorship primaries, either as delegates or as superintendents during the exercise. Then came the issue of direct and indirect primary that almost tore the party apart. 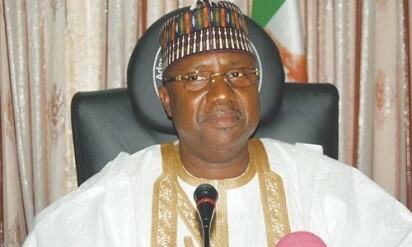 The confusion that greeted the direct or indirect governorship primary in Adamawa forced Governor Mohammed Jibrilla’s faction to threaten to dump the party. The political quagmire over the direct or indirect governorship primary led to the postponement of the exercise for some days. The governorship primary was however held but with the usual claims and counter claims of irregularities in the conduct of the exercise where Governor Mohammed Jibrilla won convincingly with 193,656 votes while Aisha Buhari’s younger brother got 15,738 with Nuhu Ribadu, the former EFCC boss scoring 8,368 votes.